Did you know lighting is one of the best places to spend money when you want to upgrade your home? 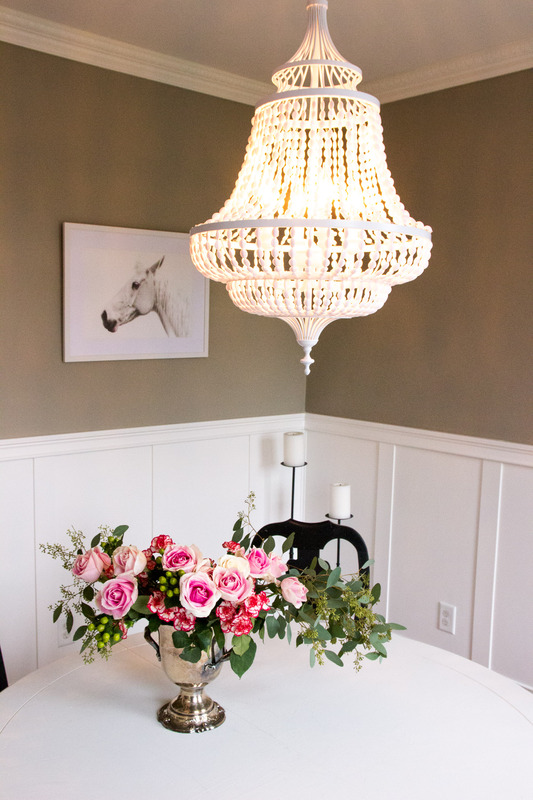 If you saw our light fixtures in our dining room and hallway before, you would know how excited I am for this reveal!!! Changing out our lighting has made a huge difference and has definitely made our house feel more like our home. I’ll be sharing some tips while shopping for lighting, plus an awesome GIVEAWAY ($500 awesome!!) from Bellacor in a post coming very soon! Both of our new light fixtures are from one of my go-to sources for lighting, Bellacor. They also offer everything from home decor to furniture. You can’t go wrong with Bellacor’s lighting options and I have used their products in multiple client projects before. Every client has been thrilled with their items too! 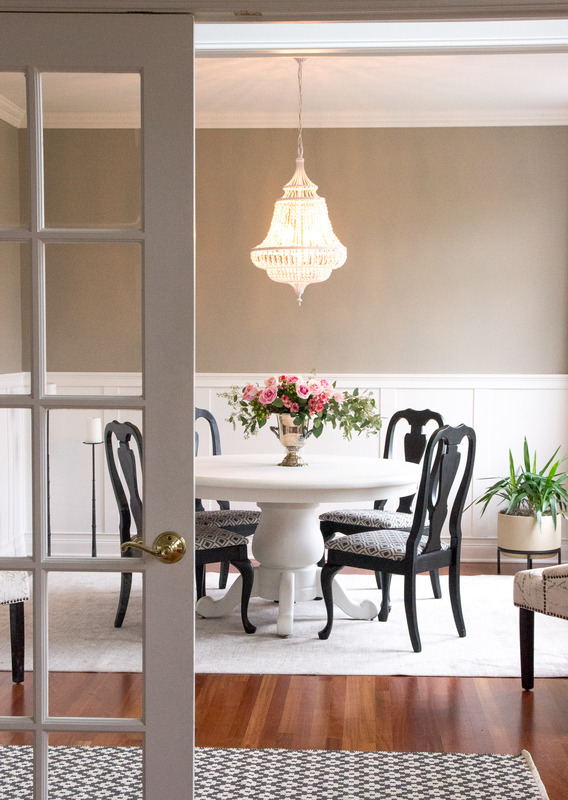 You can see the latest before and after photos of this Family Room for 5 reveal where we used a stunning chandelier. 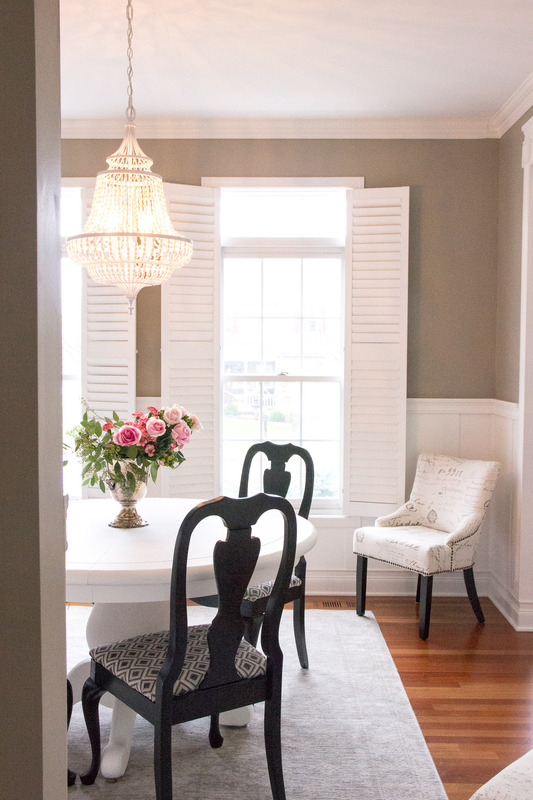 When it came to choosing a light fixture for our dining room, I wanted something with a classic shape, neutral color and interesting details. 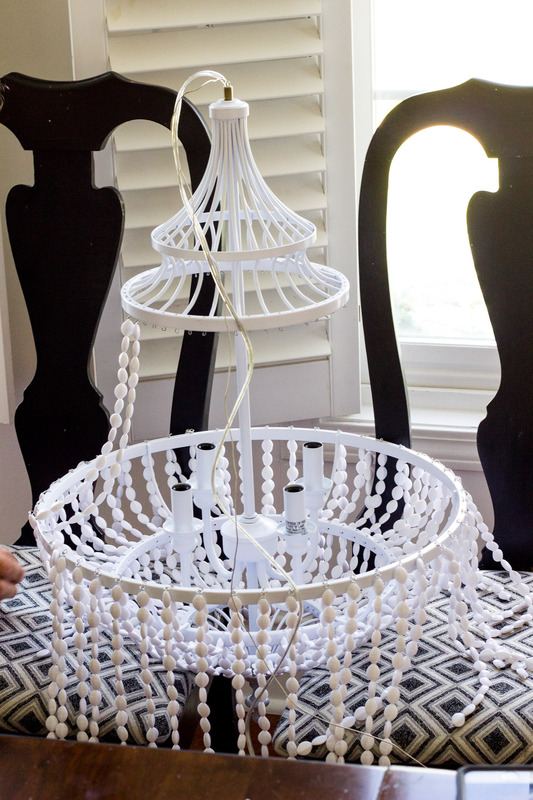 I loved the Feiss Maarid White Semi Gloss Four Light Single Tier Chandelier as soon as I saw it. 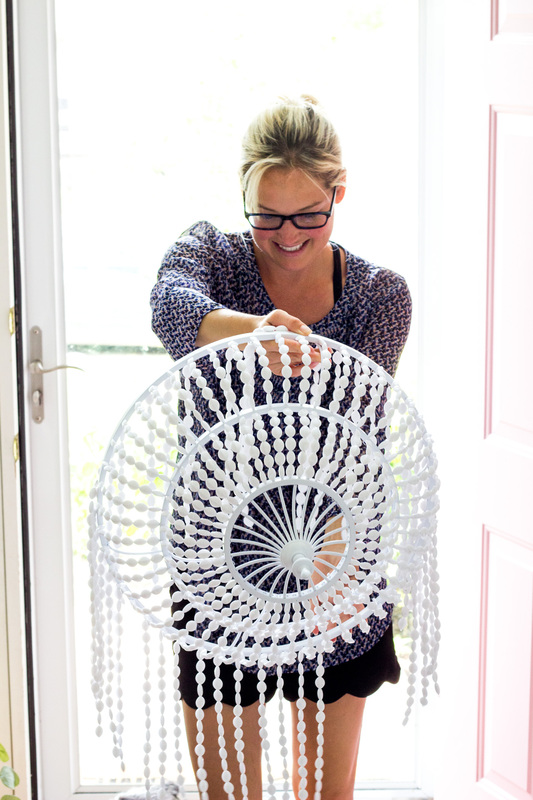 When our beaded chandelier first arrived, I was honestly a little intimated by all the pieces. I’ll clarify now that I was SO wrong! 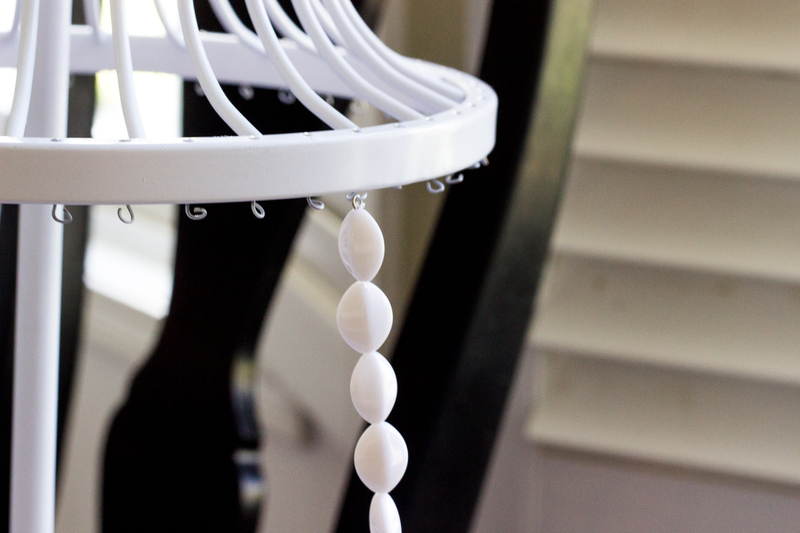 The only time consuming part was stringing the beads on the fixture. Everything else fell into place pretty easily. I had our electrician come over to assist after I had strung most of the beads. It took less than 30 mins to have the chandelier finished being put together AND installed. We still have quite a few things we want to do in our dining room (like hang some artwork and add wallpaper!) but for now, I’m enjoying taking my time with each space in the house. The light fixtures were a priority to switch out though. They looked like something out of a sci-fi movie before. 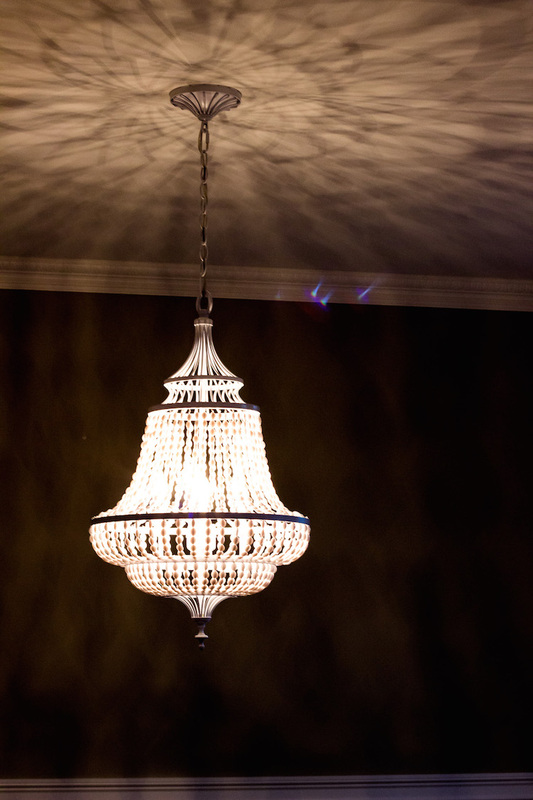 We have a sparkling chandelier that is definitely the highlight of our dining room! It’s hard to capture how the light reflects in photos but I LOVE having this chandelier turned on. It reflects on the walls and ceiling beautifully. We also put it on a dimmer (which I highly recommend!). We have it on a medium dim for family dinners and usually leave it on a light dim at night for ambience. 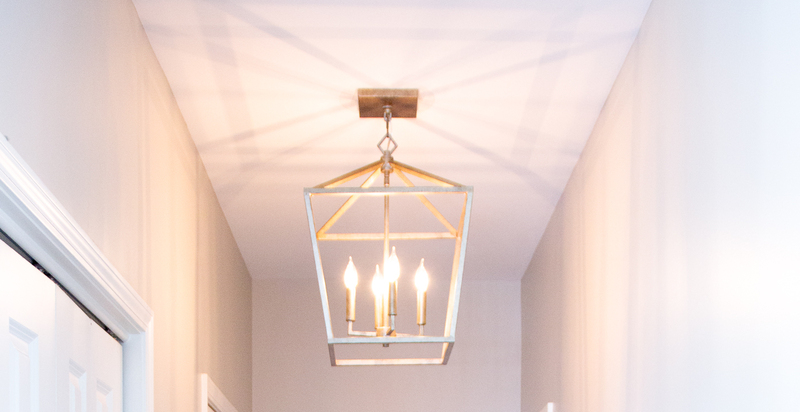 And here is one at night…..
Lantern Pendant Light – great for hallways, kitchen islands and entryways! It’s called the Vintage Gold Four-Light Lantern Pendant. Not only is this the hallway that leads to the powder room, laundry room, mud closet and garage, but you also see it when sitting at our kitchen island. We spend a lot of time at our kitchen island are are thrilled to have something pretty to look at now. 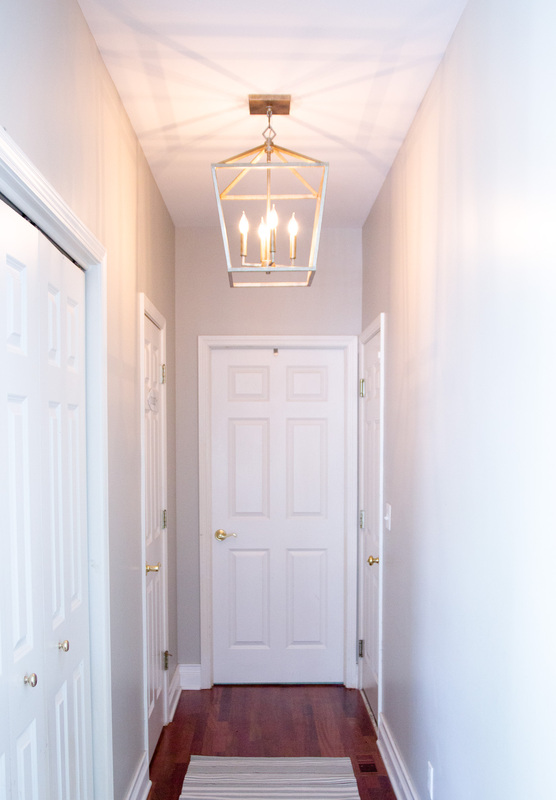 I’ve actually recommended this to 2 clients already so you will probably be seeing this light fixture again very soon here! 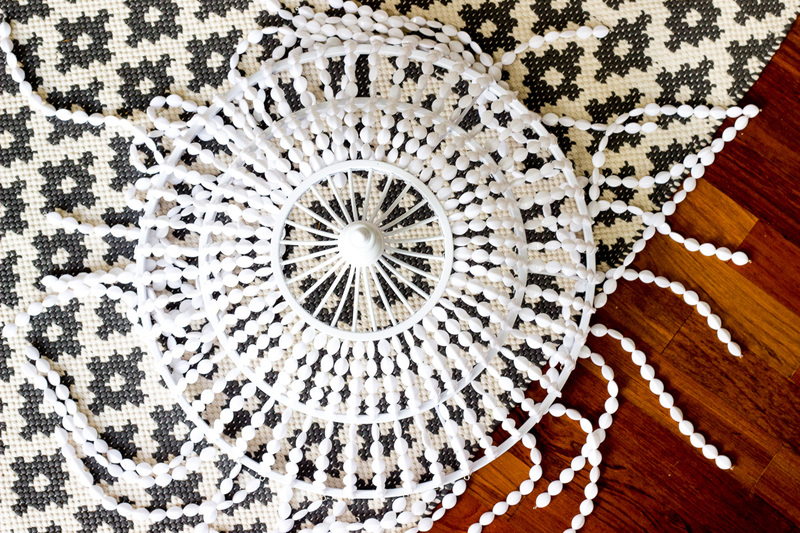 For one client, this worked beautifully in her foyer. Another project I’m working is a kitchen remodel and we are using them over the kitchen island. You know when you find something so good, you have to share! Stay tuned for the $500 giveaway from Bellacor you won’t want to miss!!! I’ll also divulge my shopping tips but in the meantime, check out Bellacor’s guide to buy lighting too. They have some great things not everyone would think about on their list! So beautifully Samantha! The chandelier really sparkles! You certainly have fabulous taste. Thank you Cynthia! I’m glad you like my taste! And yes, the chandlier does sparkle! We are just thrilled with it! Samantha, I love both of these lights. Our home is new so I find it hard to change out the light fixtures just yet but these options are certainly making me think about it. Gorgeous! Beautiful! We have shopped with Bellacor and love them! Can’t wait for your giveaway!!! Aren’t they great?! I can’t wait for the giveaway too!! I wish I could enter haha 🙂 Good luck!! Your new light fixtures are absolutely gorgeous! Thank you for sharing your beautiful spaces.